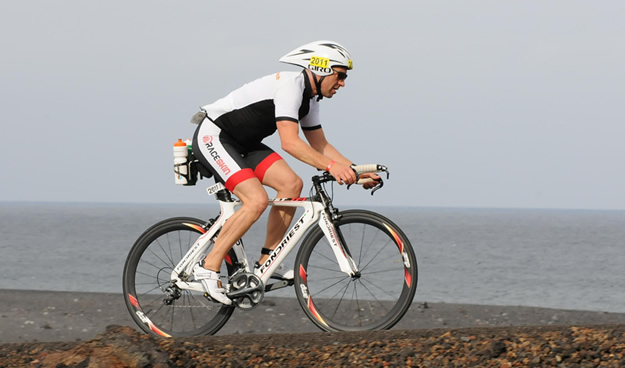 We've been following the progress of Simon Ward on his preparation towards Ironman Lanzarote 2014, as part of his Hawaii-50 target. Despite his best efforts on the day and planning and training in the lead up, qualifying for Kona went out of reach this year. Still, there are always lessons to be learned, positive and negative, and in this roundup summaries his "10 lessons from Lanzarote" with an honest review of his performance. "An untrained chimp can out-run a well trained athlete"
So this is the story of my Ironman Lanzarote preparation and racing, starting with the week before the race. 1. Acclimatision to the local conditions will make a massive difference on race day. Certainly not getting you worried by the heat will help your body to respond better, not get dehydrated and not lead to cramping and also dealing with nutrition. Worrying about the wind means you get tense so if you don't have to worry about the wind you can concentrate on your riding. We decided to fly out on Thursday 8th May so as to give us a good 8 or 9 days in Lanzarote. Having been out there for four one-week blocks since Christmas, we had a pretty good idea of the wind, the course and the temperature and that made a massive difference to us. Certainly during those weeks the wind had been pretty horrific (wind speeds up to 50 and 60 km's an hour and gusts of higher than that), and most of the people who live out there said it had been much stronger this winter than in recent winters. It was hard work, BUT, what cycling in the wind does do is give you real confidence and once you get to something like 20km an hour you really don't notice the wind and you certainly don't notice the gusts as much, particularly if it is a cross wind. During the race some of the Brits that live on the island and have raced the Ironman regularly said that these were the worst conditions for several years. Neither Fiona or I really noticed the wind or the heat. They were there, but we didn't notice either of those things as being a massive factor in the race although I am more than sure it did have some influence on my result. By leaving the UK with 8 days to go we had plenty of time to sort out any problems once in Lanzarote. So while a bike issue (i.e. damaged wheel), is stressful it's not as bad as having to run around chasing your tail 48 hours before a race. We had also completed most of the coaching work that we needed to do before flying, which meant we had a pretty relaxing time each day. Before we landed I had worked out a plan for every day which included training, daily admin tasks for either the apartment or coaching and closer to the event, the race specific actions. A simple day would have us swimming at 7am and then either riding or running closer to lunchtime to appreciate the heat of the day. Any other jobs were done in the morning leaving the afternoon and evening free to read, have dinner and go to bed early. The benefit of having a plan like this is that you complete one task and move on to the next. This helps you focus and it does calm your nerves especially as the race gets closer. So, this is something which I thoroughly recommend and will definitely be something that I will be using more of in the future. It's all very well having something written down on paper, but as soon as you start involving other people, in this case the enemy is the other athletes, things start to unravel. This year they had introduced segregated areas identifying swimming times, so there was a sub 60 minute section lined up just behind the pros with about 20 metres of free beach space between the two groups. Now I was intending to be in there, the race organiser had told me that I would be able to get in there and even though my timing chip had been over the timing mat, security sent me round to the back where I had to squeeze between lots of spectators and climb over the barriers. This meant that I was right at the back of the group with the daydreamers who can't even swim under 60 minutes and are in the wrong place and the slower swimmers in that 60 min group. The faster swimmers, the sub 55's, were stood right at the front and that is where I wanted to be. Not being able to get to that position meant that my start was much more interesting. I had to fight my way through the swimmers to find some clear water and so my start was a bit slower than I would have liked. I had to waste energy climbing over people and avoid getting bashed and stop myself getting drowned. It took about 1,000 metres before that sorted itself out. I don't know how I could have got around that, maybe I should have finished my warm up 10 minutes earlier but I was working on what the race director had told me. Well, I did have a plan – hopefully you have visited my website and seen the strategy I had laid out. I had rehearsed this and been over this several times in my mind at least once a day for the weeks before the race, so I knew it off by heart and apart from the initial problem with the swim I stuck to the plan. I swam within myself, I took it steady through transition so as not to raise my heart rate. On the bike I stuck to the same plan all the way through the 180k bike section and up until about 20km into the run. By concentrating so much, it meant I was able to ignore the weather conditions as I mentioned earlier. When I look back now the bike section seemed to go very quickly and I can't remember that much about it other than it went as planned apart from being 2km per hour slower than I had hoped to be. Either I wasn't fit enough or I could have just pushed on a bit further. Right from the beginning I knew I would get overtaken by lots of athletes because of my swimming ability and so the better cyclists tend to come through. It is tempting to chase after them, but really your race is going to unravel very quickly if you do that, so you have got to stick to the plan and be intelligent and mature. Between January and April we'd run four training camps in Lanzarote and ridden nearly 2,000km in total, swum over 50km in the sea and run 150km there. So I had a pretty good idea about the weather conditions and the course. This enabled me to have a fairly robust plan, particularly for the bike – I knew where I could push on, where I would hit wind, where I could free wheel and where I could use the aerodynamics or bike handling skills. Certainly on a couple of the descents from Mirador Del Rio and also the final drop back into Puerto del Carmen I passed a lot of people. There are quite a few twists and turns but when the corners are blind, knowing that they are not sharp, means that you can go round them without losing too much speed. I think I overtook about 30 people on the Mirador descent. Certain parts of the bike course are pretty bumpy and the two worst sections come immediately after aid stations. Knowing this I put the water bottles inside my shirt. Clearly others didn't have this knowledge as there were so many water bottles lost all over the course and I'm sure that this meant that many people were dehydrated just because they did not have any fluids. The more knowledge you can gain the better and if you do have the opportunity to go and test out a course in advance then you should take that chance. This is something that I have learned over the last year, I have a Computrainer but I don't have a power meter on my bike. What I do when I use the Computrainer is to ride a similar course profile as the race. Then I simulate the power output that I would like to put out on race day and learn what that feels like. On race day I know that riding up a hill pushing 240 watts is comfortable, but 260 is when I start to get out of breath. The more time you spend training in these zones the easier it is to detect the small differences in effort level which could make the big differences in your performance. It would be interesting to ride that course again with a power meter but not look at monitor and then see how close I could get to my goal of normalised power. Most triathletes do not have the luxury of an indoor trainer with power and a bike mounted power meter, or maybe they have a power meter but it is only on their training bike and not on their racing bike. The take home lesson is that you can learn what your body is telling you in response to certain effort levels and put this into practice on race day. I would say that I turned up to Lanzarote as fit as I have ever been – fitter at 50 than I was at 35. I think I had done just about everything I could do and that I had set out to. In a previous Tri247 post I referred to a list called “I wish I had”. On race morning my “I wish had list” was empty. Pretty much everything was going to plan until I reached kilometre 18 on the run at which point the untrained chimp woke up and wanted to get out of his cage. Unfortunately I gave him an opportunity to get out and once free that was it – obviously he is not very fit and he can't run but he wants to hold your hand, so you have to walk so he can keep up. Unless you can get rid of the chimp, he will keep coming back because he is a chimp, and so the untrained chimp can out do a well-trained athlete anytime. I was definitely not the only person accompanying their chimp along the course on race day but how I train my chimp is another matter and maybe Steve Peters can help me out with that one. Of course the chimp that I am referring to is the chimp that is mentioned by Steve Peters in his book “The Chimp Paradox”, and if you know that there is a human part of the brain and the part of the brain that contains the chimp and that tends to be the older brother and the dominant one and the trick is to learn how to control the chimp. I'm not trying to pass the blame onto a fictitious third party. Far from it. The Chimp is my way of acknowledging that I have a psychological weakness part way through the Ironman run. In a 12 hour race maybe it's not possible to have him sleeping for the whole time but you have got to know when it's ok for him to come out and when it's not ok to come out. Now certainly for me letting him out 20km into the run is a bad move. I know for a fact that most athletes don't spend much, if any time working on their psychology, but like a good swim stroke or good run technique, you can't just wheel it out on race day – these things have to practiced and practiced and practiced – so you can repeat the patterns, either the thought patterns or the movement patterns under pressure without thinking. Some athletes do not need sports psychology, but some do and those that do (including me), should practice the techniques in training. It is something that I will definitely be including in my training from this point forward. This refers back to the untrained chimp and the psychology. Fiona and I were racing the same race and on paper I am probably 4-6 minutes faster than Fiona in the swim and that's what it turned out to be on race day, 6 minutes. On paper I am probably 15/30 minutes faster than Fiona on the bike which is what turned out on race day, and on paper I am probably 20-30 minutes faster than Fiona over 42 kilometres, but that is not how it turned out on race day. Fiona ran 4.35 and I ran 4.49. What is the difference there? If it's not fitness, the difference must be psychology and the mindset. Fiona can switch her brain off, keep the chimp asleep and keep running. My chimp is much more active and he wakes up and he wants attention and that's what is the different ultimately, for most people on the run and the difference is the psychology part and not the fitness part, particularly with Ironman. So having struggled through the run I finally made it to the finish line and if you have seen my finish photo, you will see that I am still smiling, even after a tough day. But of course the one thing I have always been at pains to express to people is that you should be happy with a finish, whatever the time. Reaching the finish line in an Ironman is the accomplishment of a goal. The bottom line is that most of us are not professional athletes and our careers do not depend on us finishing these races, setting a personal best or standing on the podium and getting a pay cheque. Our careers are outside of this and triathlon is just a hobby. It saddens me when I see age group triathletes cross the finish line of an Ironman and be disappointed with their performance and then walk (shuffle) around with a long face the next day. Quite seriously, if you had a tough day, it's probably something to celebrate even more than if you had a day where it had gone to plan. My day definitely did not go according to plan but I am always happy to get to the finish; I enjoy the journey, the training and preparation, the new friends I make and the old friends I see at the races just as much as the small percentage of time I spend racing. That is what keeps me motivated. 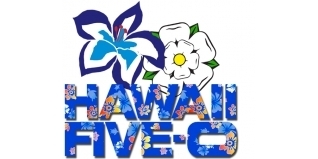 Hawaii50 isn't finished and neither is my ambition to trace in Kona. I have some serious work to do and now I know exactly how much. I'm hoping to race at Ironman Wales so I'll be putting all of my ideas into the next plan. I hope you have enjoyed this series of blogs and maybe you've even learnt something that you have been able to add to your own programme. I'll keep on writing so until next time, stay healthy & have fun! !